It was great to meet with you again today! As you likely recall, and as identified in the guide, both ARTstor and Britannica Image Quest will be fine sources for completing the image component of your assignment. For additional content, consider reading the article, Mythological painting and sculpture, from the Grove Dictionary of Art and consulting the Encyclopedia of World Mythology for background and context on your chosen myth. All the best in your research, and do be in touch with any questions, Ms. Sanborn (lsanborn at sps dot edu). Thanks for having me over! It was great to meet you all and discuss your Roman History research project. As I’m sure you recall, there is a research guide created specifically for this project. One item to mention; tightening up an ebrary search. ebrary searches every word, on every page, in every book in the ebrary collection. While this is a powerful feature, you may find it helpful to be able to retrieve a short list of ebooks specifically about your (broad) subject in Roman History. 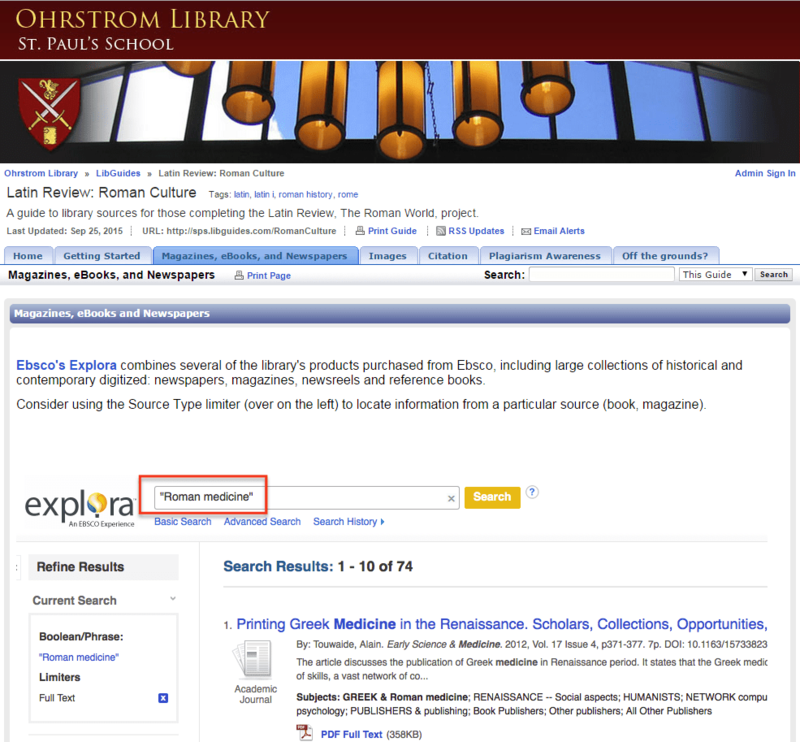 First, from the top page of ebrary, select Advanced search. Now, by changing the drop-down menu to ‘subject,’ ebrary can be asked to retrieve ebooks about a specific subject, in this case, Ancient Rome. You may also wish to simultaneously request that ebrary retrieve books with a subject of Ancient Rome that also contain the word family (or government, military, whatever is relevant to your research). This is the example given in the image below. Best of luck with your assignment & do be in touch (lsanborn at sps dot edu) if I can help as you research! Now on the Library site is a new research guide in support of the Latin 2, Caesar’s Resume Project. Also new on the Library site is an updated research guide in support of the Latin Review, Ancient Mythology in Art Project. Spotlight on: The ARTstor and Oxford Art tab within this last guide. This tab details the steps to collect images from ARTstor and swiftly import them, direct from the ARTstor database, into Powerpoint. ARTstor has an excellent video tutorial of this process. New on the Library site are two new research guides in support of two separate Latin projects – plus an update to the Artificial Intelligence guide. Research guides gather together the most pertinent library resources for a specific project, from the larger (and ever-expanding) universe of Library sources/collections. Latin Review– Research aspects of Roman daily life including family, recreation and housing. Latin Poetry & Performance – Select a Roman myth & trace its various classical iterations. A.I. – Select an A.I. topic & research both its development & present status. i.e. Legal advice, robotic surgery, autonomous driving.